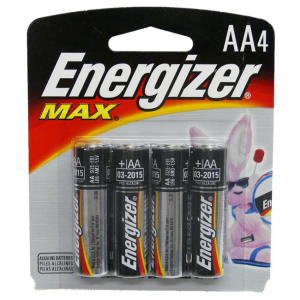 Energizer Max batteries are the latest generation of the popular Energizer alkaline line. Formulated to provide dependable power, Energizer Max batteries bring long life to the devices you depend on and enjoy. These Energizer 123 lithium batteries deliver long-lasting power to keep up with the demands of today's high-tech cameras and flash units, shot after shot. This package of 6 Energizer 123 lithium batteries provides long-lasting power for your film and digital cameras, and other similar electronics. Grab the Energizer Alkaline AAA batteries and power your headlamp, small flashlight or other device for hours. This 12-pack has a shelf life of up to 10 years, making it a common-sense investment. With locked-in power that lasts up to 10 years when in storage, the Energizer Alkaline AA batteries are perfect for powering your headlamp or small flashlight and come in a handy package of 12. This package of 12 Energizer CR123 lithium batteries provides long-lasting power for your flashlights and digital cameras, and other similar electronics. This package of 2 Energizer CR2016 3V Coin Cell Lithium batteries powers your personal electronics. This package of 2 Energizer CR2025 3V Coin Cell Lithium batteries powers your personal electronics. This package of 2 Energizer CR2032 3V Coin Cell Lithium batteries powers your personal electronics. Energizer CR2032 coin cell lithium batteries offer dependable power when you want your small gadgets to keep on going.